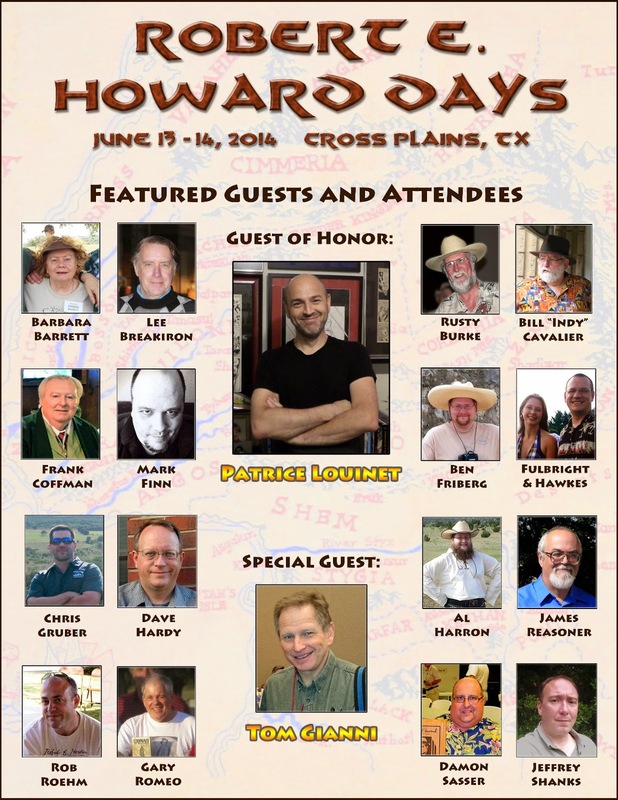 Robert E. Howard Days: REH Days Overview Part 9 - Guests Galore! REH Days Overview Part 9 - Guests Galore! One of the metaphorical phrases I like to use when celebrating something connected with Robert E. Howard is "Blaze your pistolas and brandish your Bowies!" It would serve very well if you would all do so (metaphorically speaking, of course) regarding the Featured Guests and Attendees that you see here! Patrice Louinet is our 2014 Guest of Honor and we are honored that he could come in from France this year. (We've been trying to get him for awhile now). In addition to being one of the biggest Robert E. Howard scholars in the world, he is one of the nicest guys you'll want to meet - we're glad that you'll be able to do so this year! I just have to figure out a way to get some Chicago-style pizza to him in Cross Plains! The 16 other folks shown on this poster (thanks, Jeff Shanks!) add up to several hundred years worth of involvement with Howard Fandom, but the older I get the less I feel like adding that up! Suffice to say this is one of the most erudite, eclectic groups that you'll ever meet in any walk of life. I'm proud to call them all my friends and it just goes to show you the far-reaching impact that Robert E. Howard has had on all of us here! They'll each be wearing a special name badge at Howard Days and are ready, willing and able to engage in the wonderful Howard Fellowship we all will embrace in Cross Plains this week on June 13th & 14th. Hope to see you there! In the words of the late Billie Ruth Loving, one of the founders of Howard Days,"Y'all come!" Howard Days 2014 was Howard-tastic!